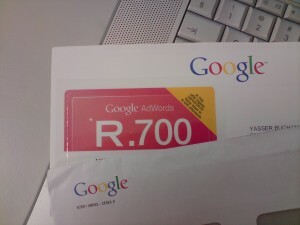 On Thursday, We ran a competition to win a google adword voucher worth R700 and promised to announce the winner by Friday @ 15H00. However, We decided to extend the deadline for an extra day. Now, Before the winner is formally announced, let me first explain how the selection came about. Random.org allows you to choose two numbers. A minimum and maximum. Based on those numbers, it generates a random a number and the generated number in this case becomes the winner. In total there were 5 comment + 9 retweets which adds up to a total of 14 entries. How coincidental that the person Whom needed it the most, actually won it. The winning number was 5 , which translates to the 5th comment — And the Google Adword voucher winner is… (Drum roll) … Itler. Congratulations to the winner, Unfortunately We do not know how to contact you. So please send us a DM to @yizzi25 or @rafiq your prize will be sent to you by monday.